Receding gums often become apparent some time after their development has begun. It can be a gradual condition that may not be noticeable until other problems manifest, such as increased tooth sensitivity. Rest assured, however, the effects of a receding gum line can be greatly improved, if not undone altogether. Read on to find out more about some prevention techniques and different treatment methods. A regular and thorough oral cleaning regimen. Dentists recommend that you brush your teeth twice daily, and floss at least once a day. It is important to thoroughly clean all surfaces of the teeth in order to remove plaque, which contains bacteria. Good oral hygiene will decrease the chances of contracting gum disease, and therefore receding gums. Personal dental care should be gentle. While it is important to administer extensive cleaning, it is worth noting that brushing and flossing should not be conducted to vigorously. Rough use of cleaning implements is likely to cause damage to gums, which can increase the chance of bacteria infiltrating the tissue, leading to infection. It is advised that a soft-bristled brush be used, and you take your time when cleaning. Frequent visits to the dentist. Depending on your personal condition, your dentist might recommend you to schedule just one or several appointments per year. Averagely, it is advisable to attend check-ups every year. Prescribed antibacterial mouthwashes and antibiotics. The dentist may prescribe certain mouthwashes and gels to reduce the bacteria and the bacteria-filled pockets. Also, antibiotics may be prescribed to fight the inflammation. Scaling and root planning at the dentist. If your condition warrants it, your dentist can perform a deep cleaning, which will often entail two processes known as scaling and root planing. These can involve the use of a manual instrument and an ultrasonic tool that uses vibrations to remove plaque. Surgical procedures. In some cases, if cleaning is not sufficient enough to improve the gum recession, it is possible to undergo surgery to enhance gum tissue. Soft tissue grafts can be positioned to the affected area, and will soon become integrated and grow successfully to the previous gum line. 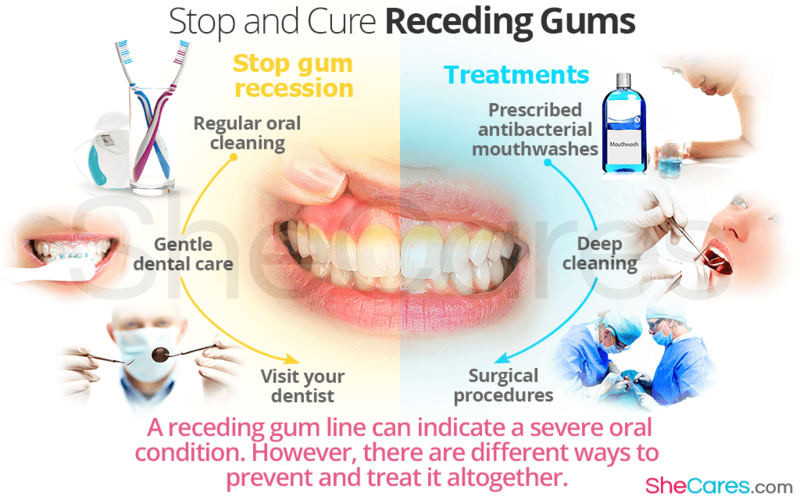 It is possible to become somewhat overwhelmed when searching for a cure for receding gums, but the most relevant thing to consider is the importance of dental hygiene for preserving gum and tooth health. If you can maintain good cleanliness, then you are much more likely to avoid gum recession or alleviate it quickly. A better understanding of how your body works will help you cope with hormonal fluctuations. Detecting symptoms of hormonal imbalance can prevent you from developing serious conditions. Implement simple lifestyle changes and natural approaches to prevent, manage, and relieve symptoms. SheCares.com is dedicated to providing reliable, up-to-date information and advice on the most common topics in women's health, including PMS, menopause, natural hormones, hormonal conditions, and fertility. ©Copyright 2019. SheCares.com. All Rights Reserved.